Although summer will be coming to an end soon, keep warm all year round by snuggling up with an adorable Cinder Kitten! Not only will it be a faithful companion, you can train it to Pet Battle as well. 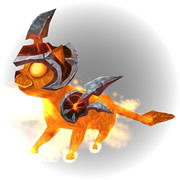 It has a combination of feline attacks and elemental abilities, but its most devastating move is its ability to tumble adorably around mid-battle. If only cute could kill! If you're interested in picking up this pet, keep in mind that the Pet Store sales are regional. The US store can be found here, and the EU store here. The sale ends September 3, 2013 so don't delay in adopting the Cinder Kitten!